Guru Arjan Dev (1563-1606) was the fifth Guru of the Sikh faith that flourished in the Punjab region of India from the sixteenth century onwards. Hazrat Mian Mir (1550-1635) was a famous Muslim Sufi saint who resided in and around the city of Lahore in the Punjab. Both men became life-long friends and devotees and their love and friendship glorifies the Sufi doctrine of love for all. The period of the fifth Guru Arjan Dev is important for many reasons. First, it was Guru Arjan who arranged for the Garanth Saheb to be recorded and it became a Sikh holy scripture of great symbolic power. Secondly, Mughal hostility and persecution became evident during his time. The Mughals, particularly Emperors Jahangir and Aurangzeb, persecuted the non-believers for political and religious reasons. In fact, not only Hindus and Sikhs but also Shia Muslims and Sufi saints became their victims. This message of tolerance and religious co-existence was well received by the masses especially the Muslim Sufi saints of the Punjab. Guru Arjan Dev often visited Lahore, the birthplace of his father, the fourth Guru Ram Das. On the occasion of one such visit he called on Hazrat Mian Mir and the two Sufi masters met and became life-long friends. Mian Mir was 13 years older than Guru Arjan. Mian Mir was highly respected by the Sikhs. He was a man who had a deep love for Guru Nanak’s teachings. Mian Mir often traveled to Amritsar to meet with Guru Arjan. In turn, whenever Guru Arjan visited Lahore he would always meet with Mian Mir. Main Mir knew a large number of Guru Arjan’s verses by heart. In 1588, Guru Arjan Dev planned to build a temple in Amritsar, now known as the Golden Temple. The temple was to be open to people of all castes and creeds. The Hindu temples were closed on three sides and their entrances were generally towards the East while Muslim mosques had entrances towards the West. The Sikh temples had entrances on all four sides denoting that God was in all directions and that the Gurudwara was open to all. 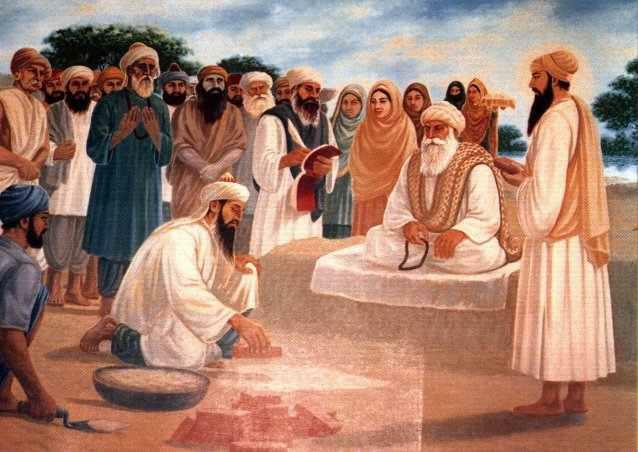 Guru Arjan invited Mian Mir to lay the foundation stone of the Golden Temple. Mian Mir was given a customary warm welcome. The two masters embraced each other in sincere love and regard. Mian Mir was delighted with Guru Arjan’s ideas, the foundation stone was laid, hymns were sung in the praise of God and sweets were distributed. The Mughals were getting uneasy with Guru Arjan’s popularity with the masses. In 1606, Guru Arjan Dev was charged by Emperor Jahangir with heresy and support of Prince Khusrow, his son, in the struggle for the throne. Emperor Akbar was unhappy with Jahangir and had designated his grandson Khusrow as his preferred choice for the Mughal throne. Guru Arjan was imprisoned in Lahore Fort and tortured. When Mian Mir heard about it, he went to see Guru Arjan. Mian Mir was deeply saddened to see his friend in such misery, but he found Guru Arjan calm and serene, having completely resigned himself to the will of God. Guru Arjan Dev was tortured to death in 1606 and became the first martyr of the Sikh faith. Mian Mir raised slogans to mourn the martyrdom of Guru Arjan. He never accepted any gifts sent by Emperors Jahangir and Shah Jahan or their ministers and nobles. A couple of years after the martyrdom of Guru Arjan, his son and successor Guru Har Gobind, then a boy of 13, called on Mian Mir at Lahore. Guru Tegh Bahadur, the ninth Guru, also met Mian Mir as a child who blessed him. This entry was posted in Navid Zaidi and tagged guru arjan dev, mian mir, Religion and Spirituality, Sufi. Bookmark the permalink.